f i r s t n a m e at firstname.org. We created the OHI/O Program in 2013, with the goal of fostering the fledgling tech culture at Ohio State. In addition to the flagship annual OHI/O Hackathon that it runs, the program has helped create spinoff events such as the hardware-focused Makeathon, and the community-focused TownHack, and promotes hacker/maker activity on campus through travel scholarships and seed grants. 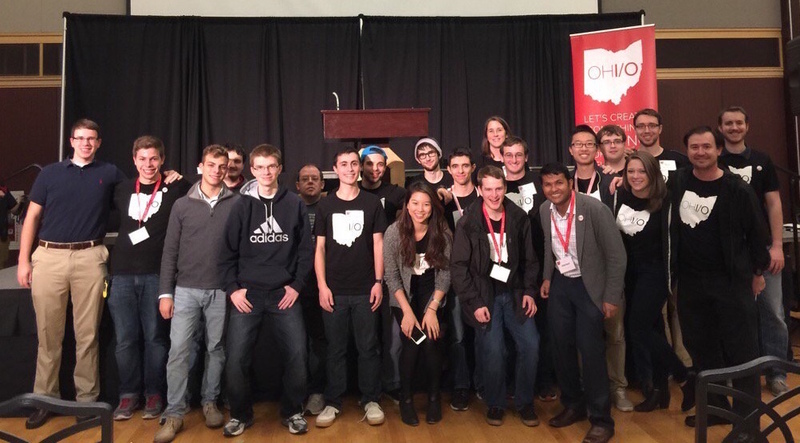 In 3 years, OHI/O has grown from a single grassroots event to the largest hackathon program in Ohio, with over 500 students attending the latest Fall event. 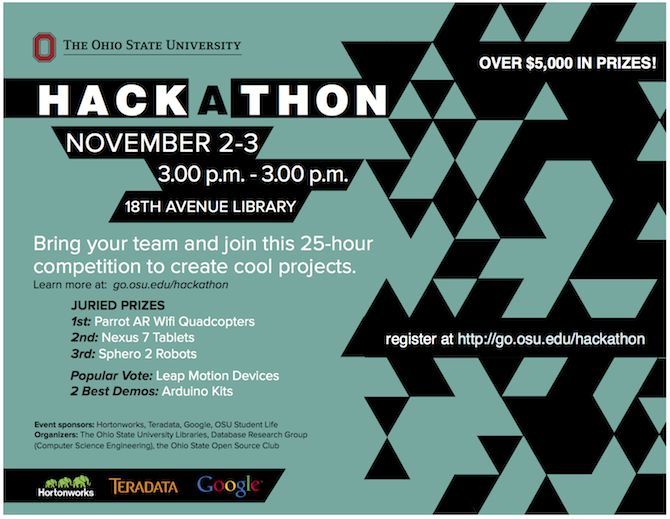 The annual flagship Hackathon at Ohio State focuses on being a healthy and informal learning experience. This is achieved by the presence of mentors and judges (comprised of faculty, staff, and alumni engineers from top tech companies) who guide the students to learn new concepts as they build out their creations. Bootstrapped with approximately $20K from the university, the event is now self-funded, and has more than doubled in attendance each year of its existence: 100+ in 2013, 200+ in 2014. This year, the event grew to over 500 student participants from universities in Ohio and beyond. The organization of the event was an excellent educational experience as well, with over 20 student organizers spanning 6 student groups, over 20 industry partners, 50 mentors, and 60 judges. As cataloged in our upcoming SIGCSE paper, feedback from students and alumni have been extremely encouraging through the years, and the renewed energy and ideas from the event directly impacted course enrollment and creation of new collaborative research projects. I am always looking for undergraduate, PhD students and Post-docs to build the next generation of interactive database systems. The group works on fun, fast-paced research in the areas of big data analytics, interactive user interfaces, statistical methods, and next-generation mobile and web technologies. To work with the group, please contact me with a link to an example of technical work you have done before (e.g., source code or demo of software, a research paper, a startup you founded, a mathematical proof). Some promo videos on why you should come to Ohio State , and Columbus, OH. The interactive data systems group has an open position for a postdoctoral researcher / research engineer in the big data analytics research area. The group works on research challenges related to empowering humans to effectively interact with data. The specific position is related to our current low-latency data cubing efforts project, and other topics related to big data analytics and business intelligence software infrastructure. The goal of the project is to build upon our prior work and develop / test / validate production-ready MVPs in real-world environments. For this specific position you should be interested and have experience in some or all of the following: distributed systems, cloud environments (EC2, Azure, GCE), algorithms (sampling, approximation), Python / Java / Scala, Postgres / Spark / Impala, Pig / Hive. You should be able to work well in team settings — this includes collaboratively writing code, publishing papers, contributing to the patenting process, and working with industry partners for deployment, testing, and validation. Proven communication skills are essential to be successful. The interactive data systems group has an open position for 1 doctoral researcher and 1 undergrad (REU) researcher in the next-generation data experiences research theme. The group works on research challenges related to empowering humans to effectively interact with data. The specific position is related to our current querying beyond keyboards, and other topics related to interactive visualization, gestural querying, and natural user interfaces. You should be able to work well in team settings — this includes collaboratively writing code, rapid prototyping, publishing papers, contributing to the patenting process and so forth. Proven communication skills are essential to be successful.